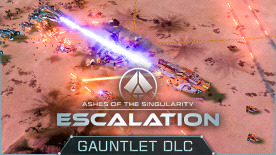 • Gauntlet Scenario- Two Substrate entities are fighting an ongoing war with tremendous armies you can’t possibly hope to match. Can you somehow cross the battlefront to capture - and hold - the lone Turinium Generator in the far north? • Tanuk - Enjoy this medium sized and symmetrical map, great for free for all, a 3-team split, or 3 player rumble! This intense map can host up to 6 players. • Nightshade - Join up with some teammates for a classic compstop on this large 4-player map, or take on 3 foes by yourself from a strong vantage point. • Frontier - Challenge yourself against your friends or the AI in this large, 5-player ice map. A single player starts in the middle on top of a winding plateau and must fend off the surrounding enemies who are mounting up to strike. • Hammer of the Gods - Duke it out for the tempting Turinium Generator in the center of the battlefield or seize control of all of the resource-rich basins on the edges of your territory in this 4-player map, great for free-for-all or 2v2 skirmishes. • Delphi - Set up your defenses on one of the plateaus dotting this small, 4-player map. Great for free-for-all or team matches, the generators and resources spread around will be sure to draw any turtles out of their shells.